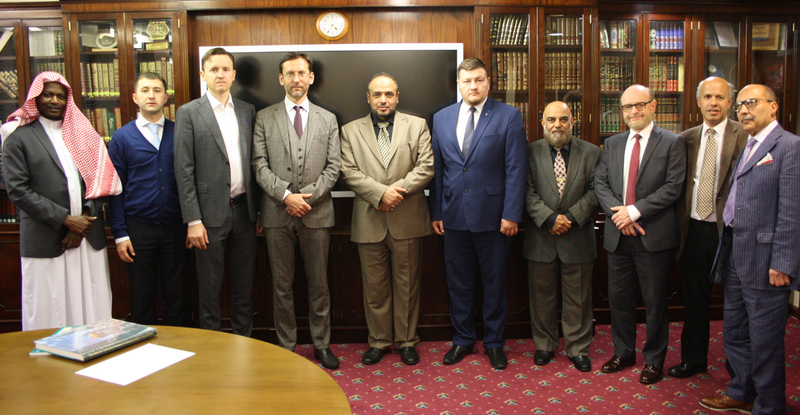 Dr Ahmad Al Dubayan the Director General welcomed a Russian delegation to The London Central Mosque Trust and The Islamic Cultural Centre. Damir Khayretdinov - Rector of Moscow Islamic University and the religious board of Muslims of the European part of Russia. IldarNurimanov - Chief of Staff of Religious Board of Muslims in Russia Federation and CEO ofMedina Publishing House. Ravil Seyfetdinov - Plenipoteniary Envoy of the Chairman of the Religious Board of Muslims of the Russian Federation of the Northwestern Federal District and First Deputy Chairman of the Religious board of Muslims of Saint Petersburg and Leningrad Region. A guided tour of the Centre was followed by lunch after which a meeting took place where members of ICC staff greeted the delegation and talked about Islam in Russia and the Russian Muslim community within the U.K.
Damir Khayretdinov explained how there are 20 Million Muslims living in Russia and that there is now over 15 national organisations within the Russian Federation looking after the interests of the Russian Muslim Community. Dr Ahmad Al Dubayan thanked the delegation for visiting the Centre and talked about the Centres' services to the Communities which also included many Russian Muslims who regularly attend The Islamic Cultural Centre here in London and also participate and volunteer in the activities. Mr Damir thanked Dr Dubayan for his efforts and work and said that is was an important role to support all the minorities within the Muslim Community of the U.K.